In stock -This product will ship today if ordered within the next 14 hours and 26 minutes. 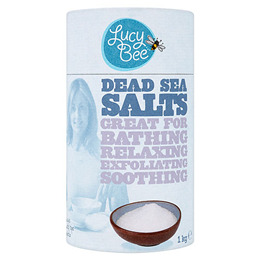 Lucy Bee Dead Sea Salts contain various essential minerals including magnesium, potassium, calcium chloride and bromides. These salts are handpicked from the Dead Sea before being washed and dried. The granules are then sieved and separated according to their various sizes. The salts can be added to a hot bath for a relaxing soak or as a homemade body scrub to exfoliate the skin. Below are reviews of Lucy Bee Dead Sea Salts - 1kg by bodykind customers. If you have tried this product we'd love to hear what you think so please leave a review. Lucy Bee Dead Sea Salts contain various essential minerals including magnesium, potassium, calcium chloride and bromides. These salts are handpicked from the Dead Sea before being washed and dried.